The North London Invaders (shortened to the Invaders) formed in 1976, and included Mike Barson (Monsieur Barso) on keyboards and vocals, Chris Foreman (Chrissy Boy) on guitar and Lee Thompson (Kix) on saxophone and vocals. Later John Hasler (drums) and Cathal ‘Chas Smash’ Smyth played bass guitar joined the band and Dikron Tulane became the lead vocalist. In 1977, Dikron Tulane left to become an actor and was replaced by Graham ‘Suggs’ McPherson. Chas Smash took off after an argument with Mike Barson, and was replaced by Gavin Rodgers. Kix also left the line-up and when Suggs, a keen Chelsea supporter, preferred to see Chelsea rather than appear for rehearsals he was asked to leave the group. John Hasler stepped up to sing lead but when he left Suggs returned and stayed. Kix eventually came back and Daniel ‘Woody’ Woodgate (drums) and bass player Mark ‘Bedders’ Bedford joined the band, replacing Garry Dovey and Gavin Rodgers, respectively. The group re-christened themselves Morris and the Minors, before settling on Madness in 1979. The name came from one of their favourite songs by ska/reggae artist Prince Buster. The band remained a sextet until late 1979, when Chas Smash re-joined and officially became the seventh member of Madness as a backing vocalist and dancer. The band became regulars at the Dublin Castle in Camden Town and soon had a strong following. They were signed to 2 Tone Records and released "The Prince," which became a surprise hit, reaching Number 16 in the Top Twenty in 1979. After an appearance on Top of the Pops the group had instant visual appeal and toured with The Specials and The Selecter, before recording their debut album. At the beginning of their career Madness attracted a skinhead audience which often got them bad publicity. Sometimes their gigs were interrupted with fights and unruly behaviour. Despite the band trying to disassociate from the sub culture the media made much of it at the time. Eventually the audience demographic changed as their music progressed. One Step Beyond (Stiff Records) was their first album and included the hit singles One Step Beyond, My Girl and Night Boat to Cairo. The former stayed in the UK charts for 78 weeks reaching Number 2 in the Top Ten Singles. Night boat to Cairo appeared on the Extended Player (EP) Work Rest and Play EP, and reached number 6 in the UK singles chart. In 1980, the band's second album, Absolutely was released in 1980, and met with mixed reviews. Not only did it reach number 2 in the UK album charts it contained three top ten singles: "Baggy Trousers" (Number 3), "Embarrassment" (Number 4), and "The Return of the Los Palmas 7" (Number 7) which was an instrumental. A year later the band changed their musical direction with a more poppy, third album, “7,” which reached number 5 in the UK album chart. As before, it contained three hit singles: "Grey Day" (Number. 4), "Shut Up" (Number 7), and "Cardiac Arrest" (no. 14, 1982). 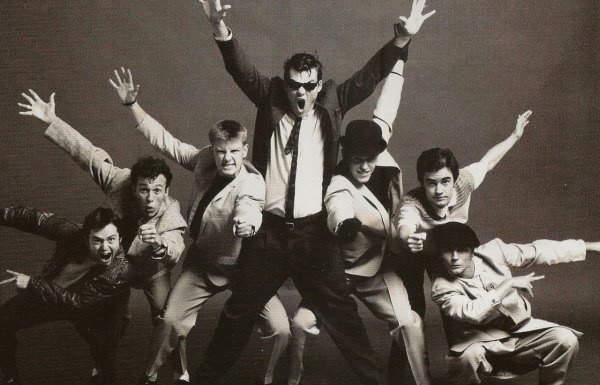 Madness finished 1981 with a cover version of Labi Siffre's "It Must Be Love" (Number 4). The song was released in the US, a year later, and peaked at number 33 in the US charts. The band put out a drama-documentary film entitled, Take it or leave it in 1981. It film had the band play themselves in a re-creation of their early days to the then-current period. "House of Fun", went to Number One in the singles charts in 1982, and the compilation album, Complete Madness which followed, did the same. The Rise & Fall album came out later in the year and was well received in the UK. It is often considered a concept album and included "Our House", which was a massive international success. Madness were back in the charts a year later with "Wings of a Dove" (Number 2) and "The Sun & The Rain" (Number 5). Their next album which would be the last on the Stiff label was Keep Moving. It charted and included two singles which made the singles Top Twenty charts: (My name is) Michael Caine (Number 11 ) and One better day (Number 17) in 1984. . When Mike Barson was tiring of the musical business and decided to spend more time with his wife. He agreed to finish the Keep moving album and the subsequent filming of the music videos for "Michael Caine" and "One Better Day" He officially left the band in December 1984. James Mackie and Paul Carrack took over keyboards for live gigs and Steve Nieve played in the studio. Madness formed their own label, Zarjazz Records (sub-label of Virgin Records) and ran their own Liquidator Studios at Caledonian Road in North London. They released Mad Not Mad which reached Number 16 in the UK album charts. The single from the album "Yesterday's Men" just made the UK Top Twenty. Mike Barson rejoined the band for what would be a farewell single, "(Waiting For) The Ghost Train", but did not appear in the music video. Musical differences had become apparent and in September 1986, the band decided to break up. The band officially split following the release of the single, which reached a high of number 18 in the UK. At first, Suggs, Chas Smash, Lee Thompson and Chris Foreman continued under the name The Madness, but after one self-titled album and two singles that failed to make the top 40, the band split up. "It Must Be Love" was re-released and reached number 6 in the UK singles chart in 1992. A singles compilation Divine Madness was released and peaked at number 1 in the album charts. The original line-up reunited and performing together at Madstock! in 1992. This was an open air concert at Finsbury Park, London. The live album was released, and "The Harder They Come" reached number 44 in the UK singles charts. Madstock ! became an annual event for the next four years. In 1999, the group went to the US and recorded a live album Universal Madness at the Universal Amphitheatre in L.A.
Suggs meantime, launched a solo career in 1995 with The Lone Ranger, which performed respectably in the U.K. charts. In 1999, Madness released a studio album, Wonderful, which charted and the single "Lovestruck", reached the Top Ten Singles chart. The Madness culture, spawned many projects including a musical based on Madness songs, One Step Beyond!, written by Alan Gilbey. The musical ran for a brief period at the Theatre Royal Stratford East in 1993, and was reprised in 2012 at Putney Arts Theatre, London. Another musical based on Madness songs, was called Our House, and ran at the Cambridge Theatre in 2003. It won an Olivier Award for best new musical of that year. Live recordings of Madness performances as well as those by other 2 Tone bands were used in the documentary film and soundtrack album Dance Craze. In 2004, the band played a series of low-key concerts as The Dangermen, performing covers of classic reggae and ska songs. The following year the group reunited with original producers Clive Langer and Alan Winstanley to record Dangermen Sessions, Vol 1 on V2 Records. The album peaked at no. 11 in the UK, but after some group disharmony, Chris Foreman left and the next two singles failed to score high in the UK charts. The band left the V2 record label shortly after. In 2007, "Sorry" was released on Lucky 7 Records, peaking in the UK charts at number 23. The following year the band were back in the charts with a re-recorded version of " NW5 (I Would Give You Everything)". It reached number 24.